My youngest niece just celebrated her first birthday. Her older sister decided she needed to have a unicorn party. I won't lie when I say I am loving that unicorns are so hot right now. 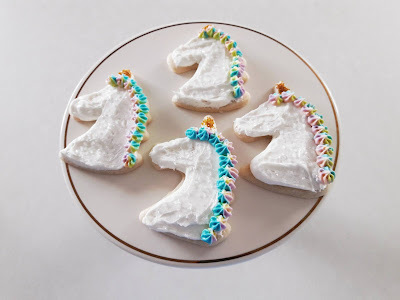 So, I offered to make unicorn sugar cookies. Using my Grandma's amazing sugar cookie recipe of course. Mix flour, sugar, salt and shortening until a crumbly mixture forms. Add in the egg, vanilla and milk and mix until well combined. The great thing about my Grandma's sugar cookie recipe is that these cookies rise and form huge fluffy cookies. I wanted to try to get them to expand a little less, for decorating purposes only! So, once the dough was complete I formed it into a flat disk and stuck it in the fridge to chill for an hour. 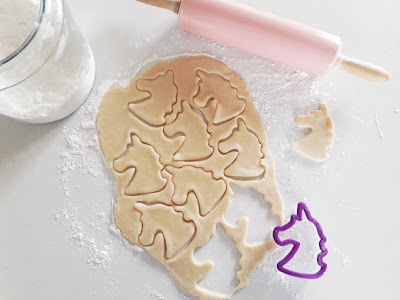 Once I had my shapes cut out I placed them on a cookie sheet and into the freezer for ten minutes before baking. If you are not worried about your cookies expanding feel free to skip these steps. Place shapes on an ungreased cookie sheet. I went super easy mode and just used buttercream frosting for my cookies. 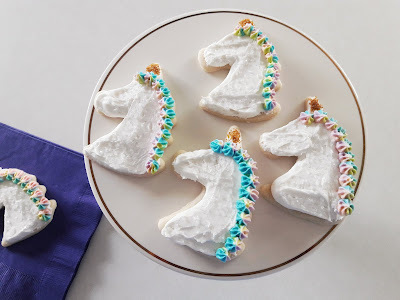 I love the look of royal icing but am all about easy decorating, especially for a crowd. I spread a thin layer of buttercream frosting over the entire cookie. Added gold sanding sugar to the horn for some magic. 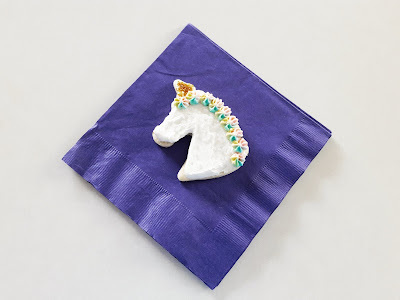 Using colored buttercream frosting and a star tip I piped the mane on. For some extra sparkle I added white sanding sugar on top. They are so cute and without much hassle. What do you think of the unicorn trend? Love it? Or leave it?